According to the data collected until April 2015, only on Facebook, each day, there were roughly 4 billion videos played back and this data increased doubly (8 billion) in August 2015. Cisco gave the prognostication that by 2019, the amount of traffic on the Internet streaming to video content will reach 80% of the total. 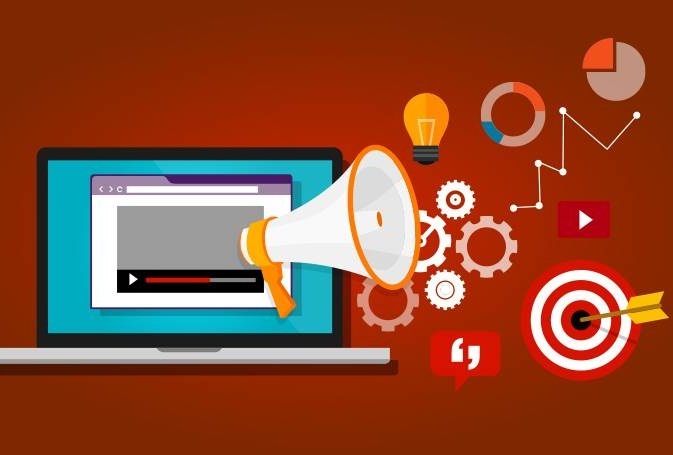 Moreover, a research firm called Demand Metric did a survey by asking the professional B2B marketers, the result revealed that 74% of people asked to agree that videos can convert better and more efficient than content types. 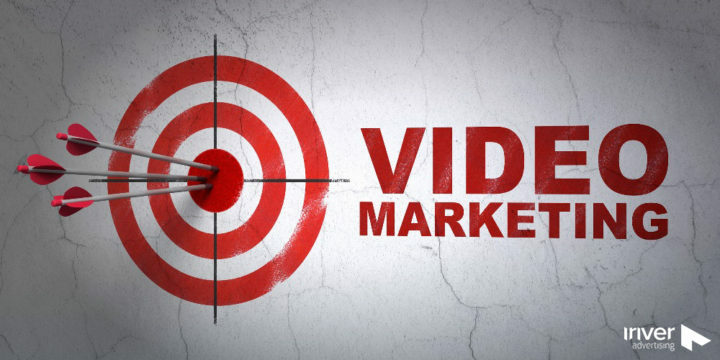 So, it is not exaggerated that video has taken an enormous step forward in recently and by and by becoming an indispensable part of each marketing strategies. The large businesses and corporations no longer invest too much on just content, they put more effort into videos and small and medium businesses are not exceptional, they also take part in that big party. The giant Google always highly appreciates and like videos. Why can we affirm like that? Because Google decided to acquire Youtube in 2006, at that time, they had recognized the potential of videos, they saw the future development of video as well as the benefits it brings to owners. If you think that example was in 10 years ago, let's take more recent proof. When you search a keyword such as "how to do something", among the results return, the videos related to the keywords are usually nearly on the top of the page. You search the name of a song, the video will always appear first. Google loves the video and you should, too. The popularity of videos on social networking sites almost reaches the saturation level. Not only Facebook or Twitter but also entire networks such as Snapchat, Vine, Periscope have developed around videos. 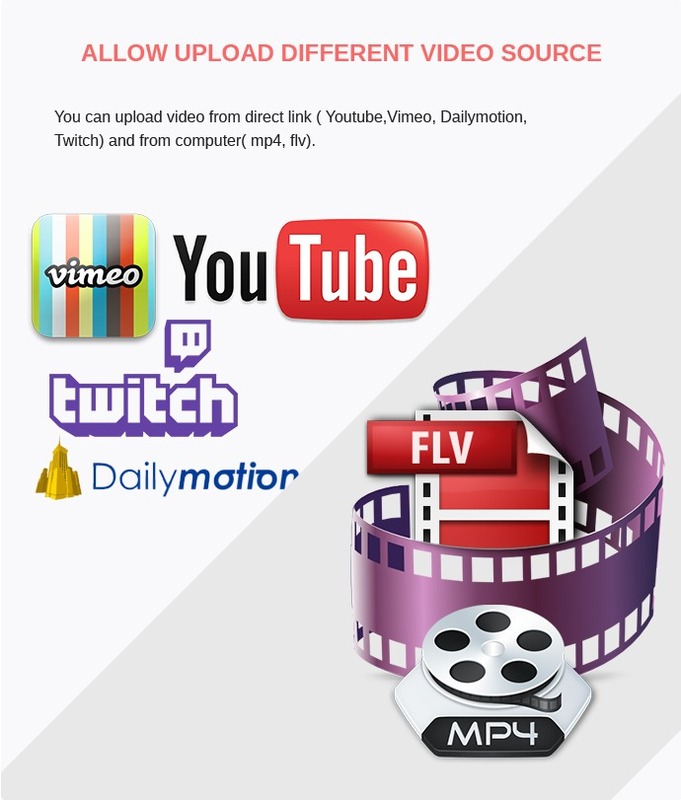 Approving video upload in Pending VideoThere are still a lot of features waiting for you to explore, we are sure that if you try it, you will totally satisfy with what it brings to your business. Be an e-commerce website, receiving the trust of customers is one of the most important factors in business. To have the belief from customers, you need to show truth through your address, product. Among the most important is information of product through name, characteristic, features, images, price… besides static information, the shop owner can display more thing for their customers through videos, it will bring fresh for all items in web shop. 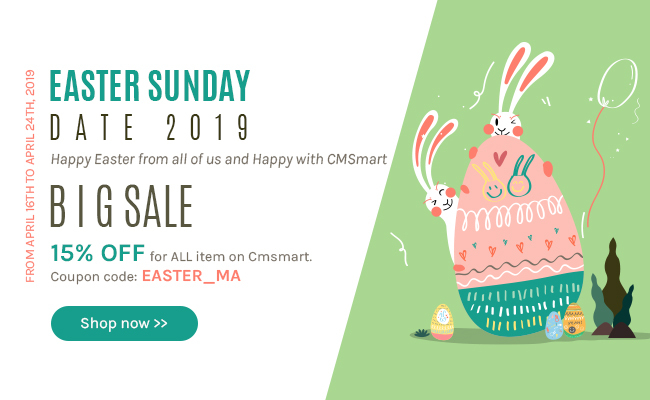 To make this function, we have released Magento Product Video Extension on Cmsmart marketplace with many amazing features that will make your e-commerce website more outstanding than others competitors. The most special feature in this extension is seven styles performance in product detail page, which you can configure in the backend of the website. Firstly, the Magento product video extension is displayed in a new tab. In this detail product page, besides many information of a product such as name, price, quality, features. Further, you can see images and videos relate to this item, they are in separate tabs. There is a list of videos related to product, they are showed by customer choice. The buyers can see from this product to another item or they can choose a video as they like. Product video extension allows customer rate this video from one star to five stars. 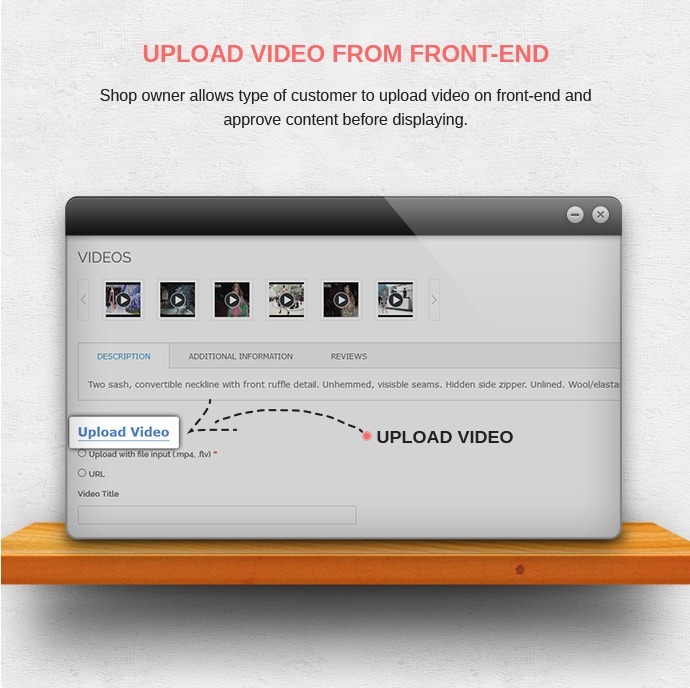 The second option, we want to introduce is your Magento product video extension is displayed in the tab bar. It is the combination of images and videos of the product in the tab bar. Two sections are changed smoothly and make the customer comfortable when clicking another tab. In tab of video, if the buyers like this video, they can rate it. 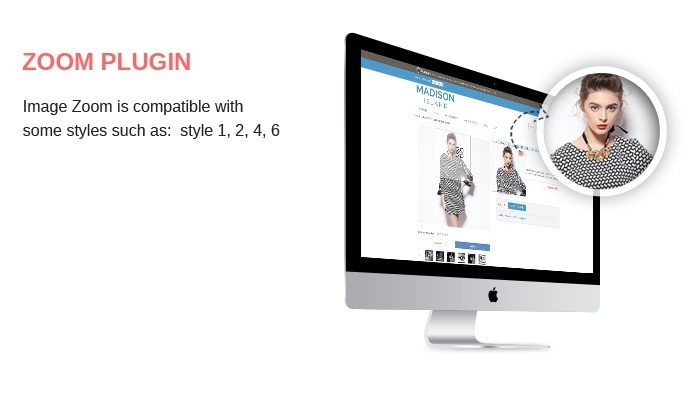 Thirdly, Magento product video extension is showed in tab bar with a popup window. In this configuration, when you click one video to watch, there is a popup window appears with this video with the list video relation and rating section. This option will make the video is showed in central large of a screen, it certainly makes your customers enjoy in each watch times. 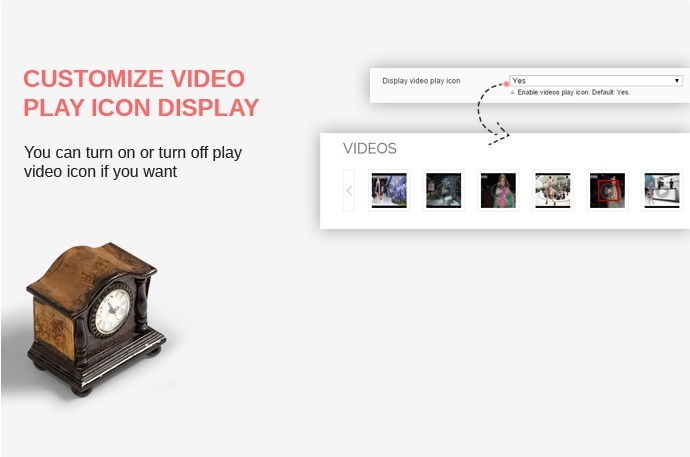 The next option you can configure in Magento product video extension is the combination of images and videos together. In this option, your customers will see images and video in one list, they can look for the suitable video relate to this product. 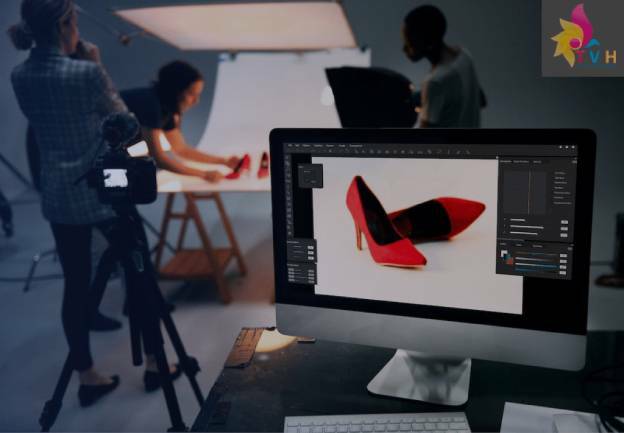 Fifthly, Magento product video extension allows shop owner configure product video and images together with the popup window. These videos are showed in a bigger popup that make your products are introduced to customers clearly and more focus. Two options which depend on the admin of this website. The first is displaying videos below images, your list video will be arranged under images. They are divided separate section will not make the buyers confused. The latest is your video list displaying images and showed in the popup window. 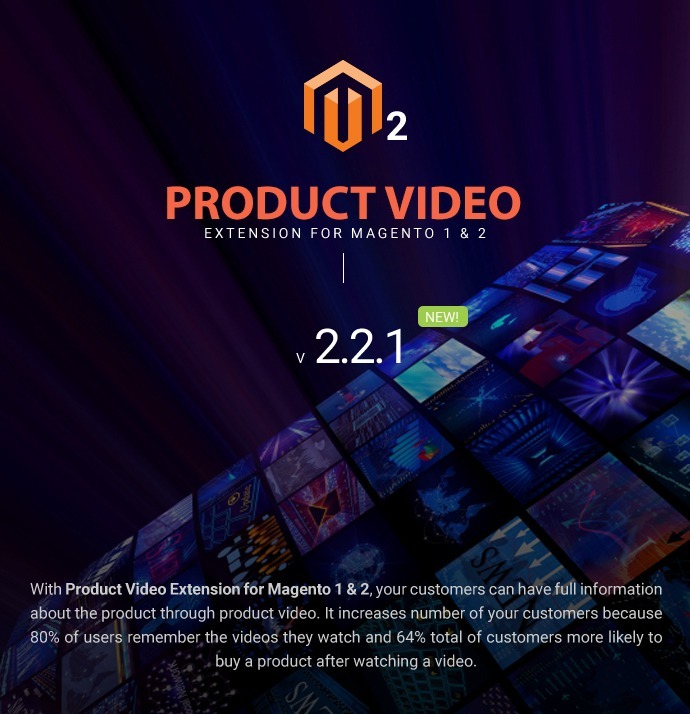 Magento product video extension is a powerful function in your e-commerce website, it is very necessary for your web shop. It not also introduces products in the best way but also bring belief for your customers. In this useful extension, the shop owner can show video relate to the professional production process of your factory which makes users interest and curious. Let integrate Magento product video extension into your website, you will see it's valued in sales volume. Nowadays, shopping online is more and more popular but how many times your products which you offered didn’t look like your imagine. Many shop owners always use good reviews to describe and marketing for their products but what did their customers receive from them? It is product which just had the similar design but low quality. It not only brings their customers never comeback but also make them doubt shopping online. And it is exactly why Magento Product Video was produced. 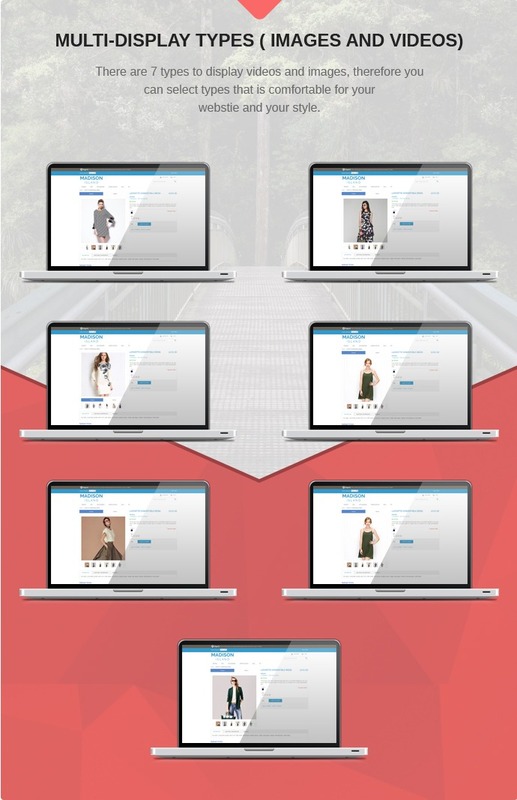 With Magento extensions shop owners can use images or videos to illustrate for their product; therefore, it not only helps customers understand clearly about products, but also builds the faith of customers on those products and your website, hence increase their sales even so their business. Add or upload multi-videos and images. 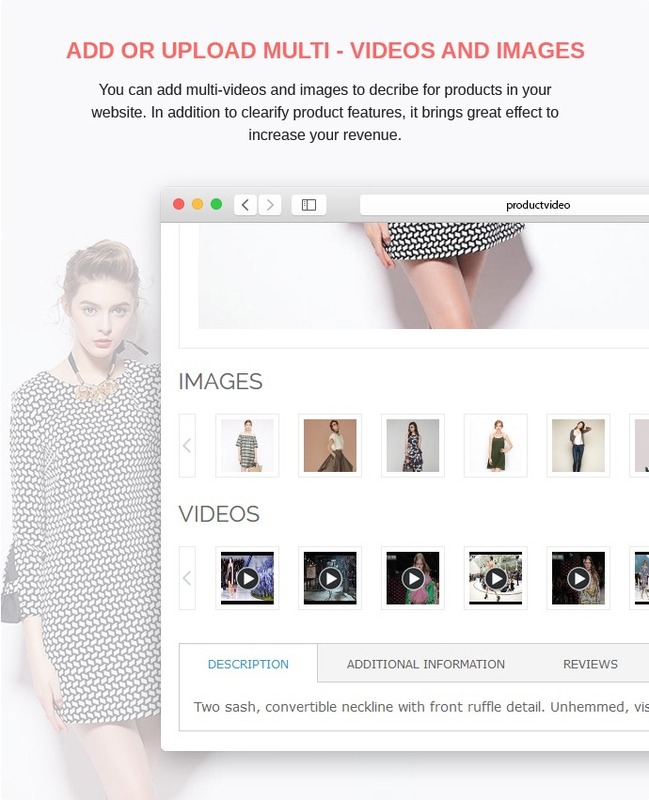 Shop owners can add multi-videos and images to describe for your products. In addition to clarify product features, it brings a great effect to increase your sales. 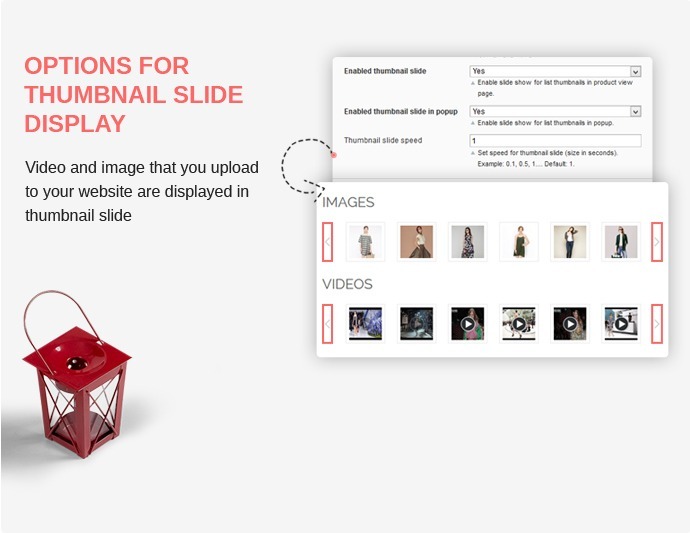 This extension brings multiple videos and images of product that make customers understand clearly. If you read product details page a thousand times and do not know what did it means, a video will be the best solution, just need one click to “Play” button and you will feel what we want to transmission. Allow upload different video source. Customers can upload video from direct links like YouTube or Twitch… and from the computer (mp4, mkv). The most important benefits of using this product is prosperous and expanding reach of customers with supporting different source of videos like YouTube or Twitch… and local video files (mp4, mkv). So do not worry about what kind of your video. 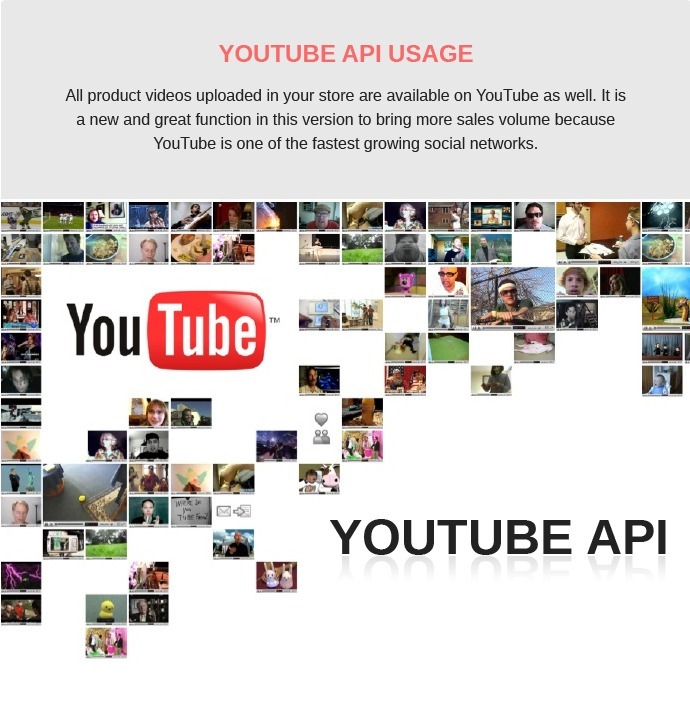 YouTube API usage. All videos that uploaded in your sites are available on YouTube as well. It is a great function that brings more sales volume because YouTube is the biggest and fastest growing social networks. Multi-display types.We got 7 types to display videos and images, therefore you can select any types that is appropriate for your website. The best and easiest way to know what your customers think is a survey. We got 5 stars rating to help your customers can show their feeling with your products. Manage all videos in back-end. All videos will be managed in “All videos” menu or it is also managed separately in a specific product. 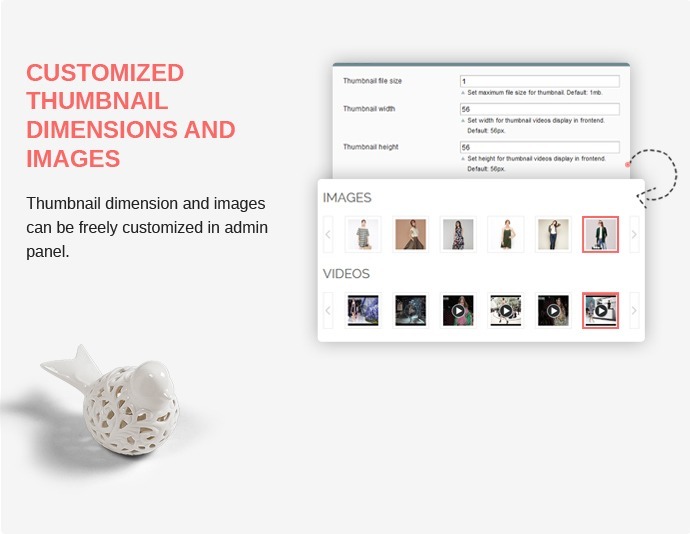 Beside it, Admin can remove video in back-end, they can also insert their product descriptions for each videos which will absolutely make their product better. Customized thumbnail dimensions and images. You can customize your thumbnail dimension and image in admin panel with just some input for file size, width or height for thumbnail. Customize “play video” icon display. It means you can choose between shows on or not “play” icon on your product videos. Playing video with pop-up window or media block. 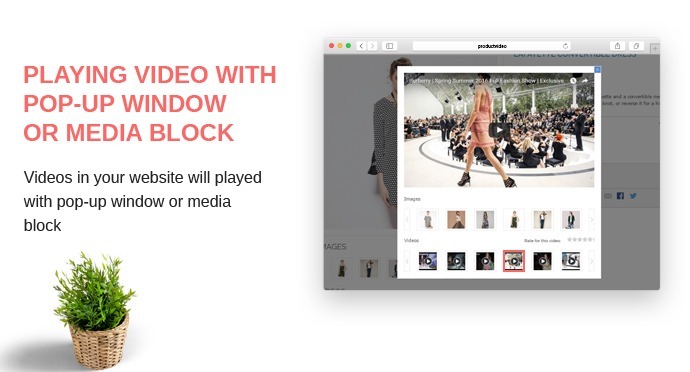 You can choose videos will be played with pop-up window or media block in your website. Admin can easily enable/disable the extension. Approve video upload in the pending video. Shop owners can approve or decline videos that uploaded from front end in "Pending Videos"menu. Admin can add new video in back-end or choose one or more type of customers as the guest, wholesale or VIP member to upload video directly on front-end. It will save so much time and keeps your sites always updating. All videos that uploaded will be faultfinding by admin before displaying. What we mentioned bove are main features of Magento Product Video. Besides, our product got some other features such as Support multiple stores, autoplay video setting, friendly and flexible configuration, unlimited product videos, easy to install without technology knowledge…. That will be great if you hold Final Cut or Adobe in your hands, but if you only have PowerPoint or KeyNote, it is still good to create a high-quality video. You can totally start with a presentation made by a PowerPoint (Windows) or KeyNote (Mac). Moreover, you can add more interesting factors to make sure that it is attractive enough to everyone. People will quickly feel boring and obsessive if they listening to an arid and dull tutorial. Besides conveying information aims, your tutorial also should be funny and interesting, it can arouse the enthusiasm of people. 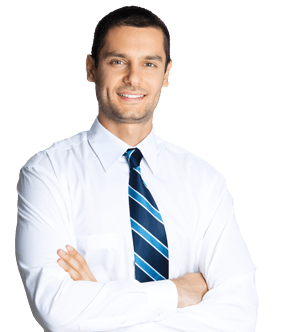 Your customers will be totally satisfied with the entirely different experience you offer. Not all people can come and join offline class due to time as well as distance problems. It is in the Internet era, why don’t you make these lectures or classes available online? If you do that, a relational connection will be built when users put your company name with an actual human face.Udemy and Teachable are the suggested options if you desire to make a full class online. Your effort may equal zero if it does not catch up with the trend. A business can be from anonymity to fame thanks to trendy videos. You can search some certain styles of video, gifs, or memes that are popular and take advantages of them. Creating a parody of a popular video is recently considers as the wonderful way to market your brand. Besides mimicking these video, you can put some of your own characteristics into parody videos to increase recognizable. Although how much effort you put into your video to create excitement and originality, never forget the final aim that is selling products. Let’s pay more attention to demonstrate your products. You should bring people a strong feeling about your brand or product by a motivational speech that personalizes your brand or using a silent montage. Video is different from other types because of artistic aesthetic and music and animation is one of the great choices. You can hire a freelance artist to finish your videos. Besides that, you can add a catchy tune or good song to get visitors’ attention. Many freelance musicians are available to help you deal with this task. Depending on the demands, you can use a hot-button issue to approach your potential customers. While not all business can apply them smoothly, why don’t you be the first one standing out in this way? Let’s make your visitors feel that their involvements play an important role by allowing visitors’ feedbacks as a jumping off point for a video. We are running a muiti store setup with a couple of domains. Do we need a separate license for each domain? Yeah. You need a separate license for each domain. Moreover, our Magento product video extension does not support Multi-store. If you want, we can make a customization for you. If you have any questions, feel free to contact me via Skype: Vincent@cmsmart.net for a quick response. can you able to add a extra future, pop up image when cliked similar to magic zoom. Can you make your questions clearer? I am so sorry for not understanding 100% what you meant. I am facing problem to show the product video in the front end of custom theme. I am using ATHLETE THEME V1.5.0 by olegnax and Magento ver. 1.9.2.4 version. I followed the instruction in pdf file for custom themes. Placed all the file. But unfortunately it's not working. Can you help me on this topic please? Do you have any video tutorial about that? I fixed the problem myself. Many thanks for your feedback. Your encouragement is a great motivation for us to improve our service as well as support better and better. Thank you so much for your remind us. Please contact us via Skype: Janet.tran.92 to get the latest version.